I've learned a lot of things over my 20-year career on Wall Street. But perhaps nothing is as valuable as talking about investing with average folks. I call it the "cocktail-party indicator." The best example that comes to mind is the only time in my life I bought an oil stock... You guessed it – BP (BP) in 2010, just after the Deepwater Horizon oil spill. Shares had gotten absolutely clobbered, falling from around $60 in April to a low of $27 in June. It seems unthinkable, even now, that the disastrous oil spill in the Gulf of Mexico could bring down the mighty BP. But investment bankers get paid to think the unthinkable – and that is just what they are doing. The idea that BP might one day file for bankruptcy, particularly as part of a merger that would enable it to cordon off its liabilities from the spill, is starting to percolate on Wall Street. The fear in the market – bordering on hysteria – was music to my ears. I'd analyzed the fundamentals and was convinced that the company wouldn't have to file for bankruptcy... and that the stock was an incredible opportunity. So on June 9, 2010, I appeared on CNBC's Fast Money. What everybody's missing here is this is truly one of the most profitable businesses on the planet. They have managed to screw everything up. There's really no excuse as best I can tell in terms of allowing this disaster to happen. The PR has been horrific ever since. And BP is going to pay billions and billions, maybe even tens of billions of dollars for this debacle. We fully expect the headlines to be horrible for a good, long time. But the stock is just too cheap. 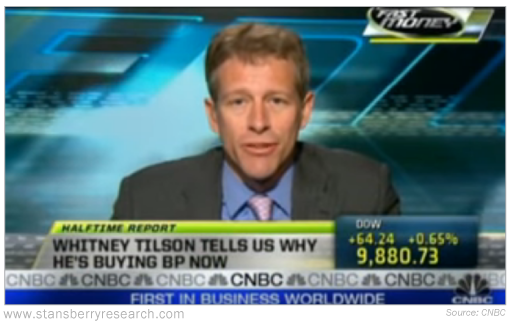 That day, BP shares closed around $29. By early August, the stock was trading around $41. Folks who took my advice were up 40% in just two months. When I looked at BP, I saw a company anyone would be embarrassed to own... And yet, it was a huge, profitable business – the kind that can weather a storm. Not only that, but it was trading at a dirt-cheap price compared to what it was worth. Those are odds I like in an investment. And as my years on Wall Street have taught me, it's a setup you should always be searching for in the markets. Editor's note: On April 17 at 8 p.m. Eastern time, Whitney is going on-camera to reveal the secret to his investing success... and announce the biggest prediction of his career. Just tune in online for free, and you'll discover how he finds ideas that could double or triple your money. Click here for more details. "When negative sentiment reaches extreme levels in this market, big gains are possible," Chris Igou writes. 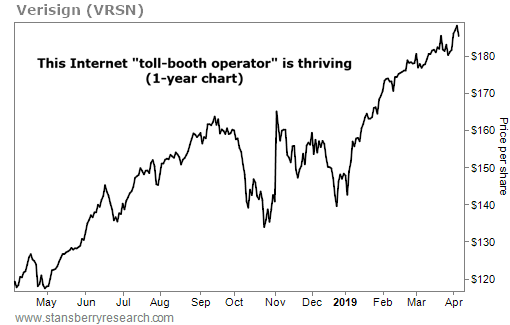 Learn more about a contrarian indicator that shows the potential for double-digit gains in a hated sector of the market right here. Verisign (VRSN) is a $22 billion domain-name provider. It owns the exclusive rights to two top-level domains – “.com” and “.net”… So when any company wants to run a website that ends in “.com” or “.net,” it means more money for Verisign. These are valuable assets – nearly half the world’s websites use “.com” domains. And last year, Verisign reported sales of $1.2 billion, up 4.3% from 2017.